Julie Brand holds her 1-month-old daughter as she receives a hepatitis B vaccine at Berkeley Pediatrics in Berkeley, Calif.
Maybe it was last January's big measles outbreak at Disneyland that scared more California parents into getting their kids vaccinated. Or maybe health campaigns have become more persuasive. Or maybe schools getting stricter about requiring shots for entry made a difference. Whatever the reasons, childhood vaccination rates last fall went up in 49 of 58 counties in California, according to data released Tuesday by state health officials. The California Department of Public Health annually reports vaccination data for kindergartners from nearly all public and private schools statewide. For the 2015-2016 school year, 92.9 percent of kindergartners were up-to-date on their shots — an increase of 2.5 percentage points from the previous term. In California, as in the rest of the nation, 2015 was a year of heated debate around vaccines. It started last January with the first reports of a measles outbreak tied to Disneyland. Then, in early February, state lawmakers introduced a bill to eliminate the personal belief exemption, which has allowed California parents to easily refuse vaccines on behalf of their children. The repeal of that exemption became law, to take effect in July 2016. But the percentage of parents citing personal belief exemptions is already declining in California, the newly released data show — from 2.54 percent of incoming kindergartners in 2014-15 to 2.38 percent this year. In addition, the percent of children receiving both doses of the vaccine against measles, mumps and rubella — or MMR — has increased from 92.55 percent to 94.59 percent statewide. "I can only assume that this is in part a response to ... the measles outbreak and the publicity that that received," says Dr. Art Reingold, head of epidemiology at the University of California, Berkeley School of Public Health. "It's unfortunate that fear or outbreaks of disease are necessary to get people to do what we'd like them to do, but I think that's human nature." 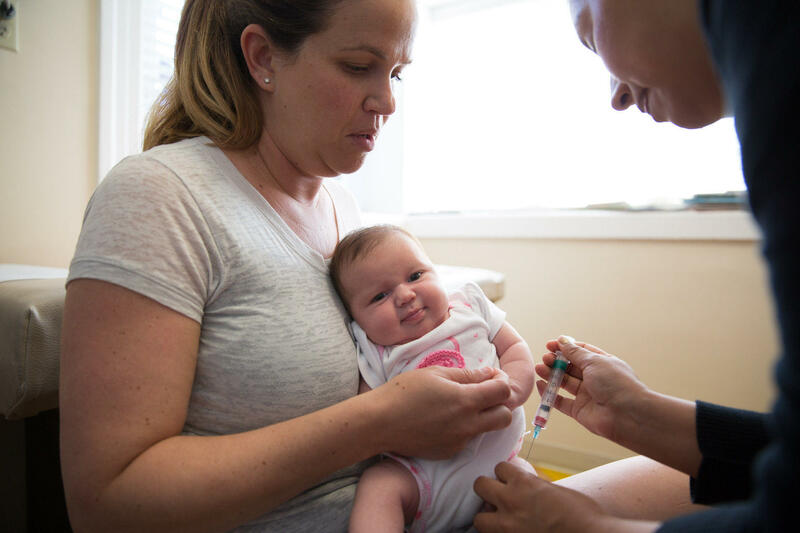 Even Marin County, a hotbed for the anti-vaccine movement, saw its personal exemption claims drop — from 6.45 percent last year to 5.97 percent this year. The county's public health officer, Dr. Matt Willis, calls the decline in Marin's rate "great news," and notes that this is the third year in a row of increasing vaccination rates. "We haven't seen this many children vaccinated in Marin County since 2007," he says. Still, a decline in the number of parents formally refusing to vaccinate their kids isn't the only reason for the statewide improvement in vaccination rates, according to James Watt, chief of the division of communicable diseases in the state's department of public health. Another big factor, Watts says, is a decline in what are known as "conditional admissions" to schools. These are kids who show up on their first day of school having received some — but not all — of the required immunizations. Often, schools go ahead and allow these children to start class, with the understanding that their parents will make sure the students get the remaining shots as soon as possible. But that's not what the law demands. "If those children could get a dose 'today,' they're not supposed to be admitted to school," Watt says. The problem, he explains, is that lots of kids have been enrolling with "conditional entry" who don't go on to get the rest of their shots. By working with parents and school districts to explain and enforce the rules — and vaccinate more kids — the state was able to reduce the overall number of conditional admissions from 6.9 percent of all enrolled kindergartners in 2014-2015 to 4.4 percent this year. "The outbreak of measles was a real wake-up call for all of us around this issue," Willis says. "It gave us a chance to speak openly as a community about what vaccination does for us. It gave us a chance to understand vaccination as a matter of community responsibility." Dr. Olivia Lang, a Berkeley pediatrician, said she's seen a change in her practice, too. "There were a lot of families who had been waffling on vaccines, but perhaps were not strong believers in anti-vaccination ideals," she says. "But now they're saying, 'Well, I guess we're going to have to do it,' " and so they are getting their children vaccinated. Starting with the 2016-2017 school year, all kindergartners and seventh-graders in California will need to be up-to-date on their immunizations to enter school. Only those children who cannot be vaccinated for medical reasons will be exempt. A version of this story first appeared on KQED's State of Health blog.